Thrombosis is generally considered harmful because it compromises the blood supply to organs. However, recent studies have suggested that thrombosis under certain circumstances plays a major physiological role in early immune defense against invading pathogens. This defensive role of thrombosis is now referred to as immunothrombosis. Activated monocytes and neutrophils are two major inducers of immunothrombosis. Monocytes and neutrophils are activated when they detect pathogen-associated molecular patterns (PAMPs) and damage-associated molecular patterns (DAMPs). Detection of PAMPs and DAMPs triggers tissue factor expression on monocytes and neutrophil extracellular trap (NET) release by neutrophils, promoting immunothrombosis. Although tissue factor-mediated and NET-mediated immunothrombosis plays a role in early host defense against bacterial dissemination, uncontrolled immunothrombosis may lead to disseminated intravascular coagulation. Blood must be maintained in a fluid state under physiologic conditions, but then change to a solid state after vascular injury. This balancing act is accomplished by platelets, coagulation factors, anticoagulant factors, fibrinolytic factors, endothelial cells, and possibly leukocytes, which all support the dynamic equilibrium that provides proper blood flow . Disruption of this well-regulated balance leads to pathologic conditions, such as thrombosis and bleeding. Platelets and coagulation factors are two major players in hemostasis. Platelets and coagulation factors circulate in the blood and become activated at sites of vascular damage. Platelets monitor vascular damage using cell-surface sensors for subendothelial collagen and von Willebrand factor bound to collagen. Engagement of the subendothelial matrix by platelets results in a sequence of reactions comprising platelet adhesion, activation, and aggregation, leading to platelet thrombus formation . Coagulation factors, more specifically coagulation factor VII, search for sites of vascular damage where subendothelial tissue factor is exposed. Binding of coagulation factor VIIa to tissue factor results in a cascade of blood-clotting reactions, leading to thrombin generation and subsequent fibrin deposition at sites of vascular damage (Figure 1). Platelet thrombus formation and fibrin deposition occur concomitantly as thrombin activates platelets, and activated platelets expose phosphatidylserine on their membrane surface to provide a scaffold for blood-clotting enzyme complexes . Basic mechanisms of coagulation. Coagulation factor VII searches for sites of vascular damage where subendothelial tissue factor is exposed. Tissue factor is expressed on the surface of fibroblasts and pericytes in the subendothelial space. Binding of coagulation factor VIIa to tissue factor results in a cascade of blood-clotting reactions, leading to thrombin generation (the initiation pathway). Once small amounts of thrombin are generated in this pathway, thrombin plays a crucial role in the amplification and propagation phases of coagulation by activating coagulation factors V, VIII, and XI (the amplification pathway). This leads to a burst of additional thrombin generation, which is essential for forming sufficient fibrin and sealing the sites of vascular damage. Coagulation factor XIII then crosslinks fibrin fibers, a fundamental process for stabilizing fibrin clots. Contact activation of coagulation factor XII, another important trigger of coagulation in laboratory tests, is not considered essential for hemostasis. In the hemostatic system, thrombin generation is triggered by the factor VIIa-tissue factor complex, an inducer of the so-called extrinsic pathway. 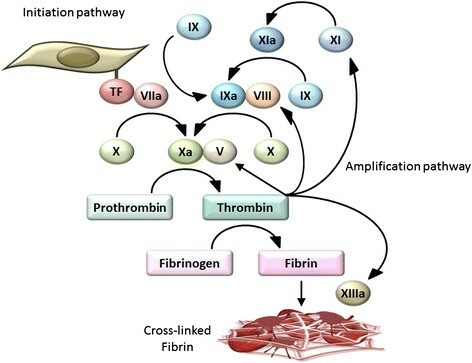 Once small amounts of thrombin are generated in this pathway, thrombin plays a crucial role in the amplification and propagation phases of coagulation, the so-called intrinsic pathway, by activating coagulation factors V, VIII, and XI (Figure 1) . This leads to a burst of additional thrombin generation, which is essential for forming sufficient fibrin and sealing the sites of vascular damage. Coagulation factor XIII then crosslinks fibrin fibers, a fundamental process for stabilizing fibrin clots. Contact activation of coagulation factor XII, another important trigger of coagulation in laboratory tests, is not considered essential for hemostasis because hereditary deficiencies in factor XII are not associated with abnormal bleeding ,. However, factor XII might be involved in pathological thrombosis - and could be a unique drug target suitable for preventing thrombosis without affecting normal hemostasis . The propagation of a hemostatic plug can be terminated when it reaches intact endothelium. Endothelial cells express several anticoagulants, including thrombomodulin (TM), tissue factor pathway inhibitor (TFPI), and heparan sulfate (Figure 2) ,. Upon binding to TM, thrombin loses its ability to activate platelets, fibrinogen, and coagulation factors V, VIII, XI, and XIII . Furthermore, the thrombin-TM complex activates protein C, which in turn stops thrombin generation by inactivating coagulation factors Va and VIIIa. Endothelial cells also synthesize and display heparan sulfate proteoglycans on their surface, which bind to TFPI and antithrombin (AT), inhibiting the factor VIIa-tissue factor complex, factor Xa, and thrombin activity . Thus, endothelial cells play a role in regulating the spatial localization of hemostatic plugs. Disruption of this well-regulated balance leads to thrombus formation inside blood vessels (i.e., thrombosis) . Anticoagulant properties of endothelial cells. Endothelial cells express several anticoagulants, including thrombomodulin (TM), tissue factor pathway inhibitor (TFPI), and heparan sulfate. Upon binding to TM, thrombin loses its ability to activate platelets, fibrinogen, and coagulation factors V, VIII, XI, and XIII. Furthermore, the thrombin-TM complex activates protein C, which in turn stops thrombin generation by inactivating coagulation factors Va and VIIIa. Endothelial cells also synthesize and display heparan sulfate proteoglycans on their surface, which bind to TFPI and antithrombin (AT), inhibiting the factor VIIa-tissue factor complex, factor Xa, and thrombin activity. IIa thrombin, PS protein S.
Microvascular thrombosis is a frequent complication of critical illness conditions, such as sepsis, trauma, and malignancy . Thrombosis is generally considered harmful because it compromises the blood supply to organs. However, recent studies have suggested that thrombosis under certain circumstances plays a major physiological role in immune defense ,. This defensive role of thrombosis is now referred to as immunothrombosis . Thrombus formation and innate immunity are closely linked . Upon injury, multicellular organisms face two major crises: bleeding and infection. To overcome these crises, multicellular organisms have developed hemostatic systems and immune systems. In horseshoe crabs, a single hemocyte type circulates in their open circulatory system and plays significant roles in both hemostasis and innate immunity . The hemocytes release procoagulant serine protease zymogens when they detect lipopolysaccharide (LPS) on their surface. The activation of these zymogens triggers the coagulation cascade, which ultimately converts coagulogen into insoluble coagulin gels . Coagulin clots are important not only for sealing injured sites but also for trapping invading pathogens and supporting antimicrobial defense. Thus, the hemocytes of horseshoe crabs can detect and respond sensitively to LPS, maintaining hemostasis and host defense against invading pathogens. Horseshoe crab hemocytes are now used for laboratory measurements of endotoxins. Coagulation systems in mammals also play important roles in immune defense. Fibrinogen-deficient mice display impaired cytokine production, suppressed neutrophil recruitment, increased bacterial burden, and increased mortality after bacterial inoculation ,. Furthermore, mice pretreated with anticoagulants, such as coumadin or hirudin, also display increased bacterial burden and mortality following bacterial inoculation ,. These phenotypes indicate protective roles of coagulation systems during early host defense against bacterial dissemination. In humans, coagulation systems are also activated during infection . However, it remains to be determined whether anticoagulant therapy improves or worsens the clinical outcomes of patients with infectious diseases. Platelets have important roles in fighting infections. Upon bacterial infection, platelets rapidly accumulate on the surface of bacteria caught by Kupffer cells . The platelet-mediated encasement of bacteria restricts their escape from Kupffer cells. This event precedes leukocyte recruitment and contributes to early host defense against infection in mice. Platelets are able to release antimicrobial molecules and proinflammatory mediators, which may further support host defense against infection . In humans, thrombocytopenia is increasingly recognized as an independent risk factor for serious infections . Furthermore, antiplatelet therapy may be associated with increased incidence of community-acquired pneumonia , although it may also be associated with better outcomes in patients with severe infections ,. These observations suggest that platelets may be important in early host defense against invading pathogens before infectious diseases develop but may be deleterious if infections progress to severe forms with organ failure. To date, four mechanistic models have been proposed for how immunothrombosis provides protection against invading pathogens (Figure 3) . First, immunothrombosis limits microbial dissemination by retaining microbes within thrombi. In this regard, coagulation factor XIII crosslinks bacteria to fibrin fibers, leading to immobilization and killing of bacteria inside the clot . Second, thrombi form protective barricades inside and/or around blood vessels that limit microbial movement in and out of the vessels . Third, fibrin, fibrinogen, and fibrin/fibrinogen degradation products promote recruitment and activation of leukocytes, such as neutrophils and macrophages, coordinating cellular immune responses to pathogens at sites of infection . Fourth, intravascular thrombi yield a distinct compartment where antimicrobial peptides are concentrated and have increased opportunities to come into contact with pathogens. Antimicrobial peptides can be released not only by leukocytes but also by platelets and coagulation systems during the process of immunothrombosis ,. Four mechanistic models explaining how immunothrombosis provides protection against invading pathogens. (1) Immunothrombosis limits microbial dissemination by containing microbes within thrombi. (2) Thrombi form protective barricades inside and/or around blood vessels that limit microbial movement in and out of the vessels. 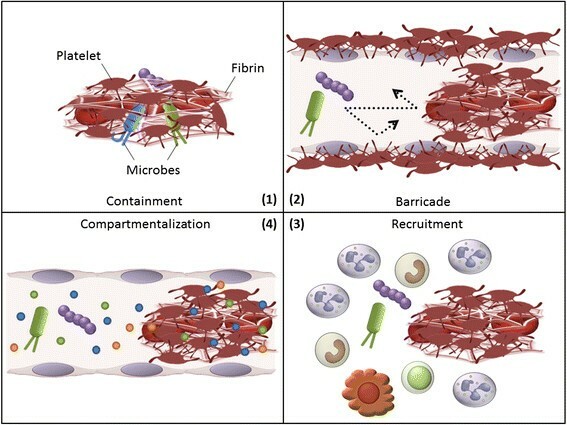 (3) Fibrin, fibrinogen, and fibrin/fibrinogen degradation products promote recruitment and activation of leukocytes, such as neutrophils and macrophages, coordinating cellular immune responses to pathogens at sites of infection. (4) Intravascular thrombi yield a distinct compartment where antimicrobial peptides are concentrated and have increased opportunities to come into contact with pathogens. What are the triggers for immunothrombosis? During the course of infections, platelets and coagulation factors can become activated even in the absence of contact with subendothelial collagen and tissue factor. It is now widely believed that instead of subendothelial collagen and tissue factor, neutrophils and monocytes could serve as the triggers for immunothrombosis (Figure 4) . Triggers for immunothrombosis. Detection of PAMPs and DAMPs triggers NET release by neutrophils and tissue factor expression on monocytes, promoting immunothrombosis. NETs are able to activate coagulation factor XII, inactivate anticoagulant TFPI, and provide a scaffold for platelet binding and aggregation, all of which promote thrombus formation. A part of monocyte-associated tissue factor is released in the form of microparticles and delivered into developing thrombi. Monocytes are a potential source of tissue factor in circulating blood . In contrast to subendothelial tissue factor constitutively expressed on fibroblasts and pericytes, monocyte-associated tissue factor expression is normally very low and increases in response to pathogen stimuli . Genetic reduction of tissue factor expression on leukocytes reduces LPS-induced thrombin generation ,, suggesting that tissue factor on leukocytes activates coagulation in response to pathogen stimuli. Furthermore, low tissue factor expression results in bacterial dissemination and poor outcomes following bacterial inoculation . These findings indicate that monocyte-associated tissue factor is an important inducer of immunothrombosis. 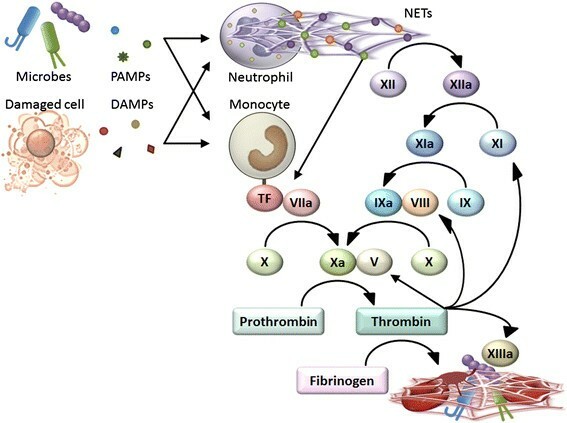 Neutrophils and neutrophil extracellular traps (NETs) are other inducers of immunothrombosis . In response to pathogen stimuli, neutrophils initiate a program involving rearrangement of the nuclear and granular architecture, leading to extracellular release of NETs. NETs are composed of web-like structures of DNA and antimicrobial proteins such as histones, neutrophil elastase, and myeloperoxidase, and have the ability to entrap and kill microbes ,. NETs are also able to activate coagulation factor XII , inactivate anticoagulant TFPI , and provide a scaffold for platelet binding and aggregation , all of which promote thrombus formation . Blockade of NET activity by DNase or antibodies against DNA-histone complexes results in decreased thrombus formation ,, and increased microbial dissemination ,-, indicating that NETs play a critical role in immunothrombosis. As mentioned above, activated monocytes and neutrophils are two major inducers of immunothrombosis. Therefore, the next question is what activates monocytes and neutrophils to induce immunothrombosis? Pathogen-associated molecular patterns (PAMPs) and damage-associated molecular patterns (DAMPs) might be responsible. The adaptive immune system composed of T and B lymphocytes monitors non-self antigens using antigen-specific receptors. Self-reactive lymphocytes are deleted early in life, and residual lymphocytes establish a surveillance system for non-self antigens. Although this system is highly specific and effective for non-self antigen elimination, it is not perfect because immune responses against harmless non-self components, such as fetuses or foodstuffs, can be deleterious and should be avoided . Innate immune cells, including monocytes and neutrophils, employ a different surveillance system. They monitor common molecular patterns of microbes (PAMPs) and/or molecules from damaged cells of host origin (DAMPs) using pattern recognition receptors (PRRs) and only activate the adaptive immune system if they detect PAMPs and/or DAMPs. Thus, the innate and adaptive immune systems develop a mutually complementary relationship, and the overall immune system constructs a surveillance system for infectious non-self and/or damaging non-self antigens ,. PAMPs, comprising molecular structures unique to microbes, are subject to innate immune monitoring by the host. For example, cell wall components, such as LPS and β-glucan, or flagellar components, such as flagellin, are recognized as PAMPs, and PAMP detection by PRRs triggers proinflammatory and antimicrobial responses in innate immune cells . PAMP detection also triggers tissue factor expression on monocytes , and NET release by neutrophils , promoting immunothrombosis. DAMPs are endogenous molecules that are normally found inside cells, unless released by damage. Under normal conditions, DAMPs are hidden from recognition by innate immune cells. However, under conditions of cellular stress or injury, DAMPs can be released into the extracellular space from damaged cells, activating innate immune cells . Prototypical DAMPs include nuclear proteins such as high mobility group box 1 (HMGB1) , and histones , purine metabolites such as ATP , and uric acid ,, and mitochondrial components such as formyl peptides and mitochondrial DNA . Detection of these DAMPs by PRRs, such as Toll-like receptors and inflammasomes, triggers inflammation, which is important for eradication of invading pathogens, clearance of dead cells, and regeneration of damaged tissue . DAMPs also trigger intravascular thrombus formation , possibly by inducing tissue factor expression on monocytes , elevating tissue factor procoagulant activity ,, and promoting platelet aggregation . Although immunothrombosis might be important in early host defense against bacterial dissemination, uncontrolled immunothrombosis might be detrimental to the host. Disseminated intravascular coagulation (DIC) occurs in 25%–50% of patients with sepsis and is associated with poor outcomes ,. DIC is characterized by widespread microvascular thrombosis with exhaustion of coagulation factors and platelets . Monocyte-associated tissue factor and neutrophil-derived NETs are predisposing factors for DIC ,,,,, indicating that DIC might be an advanced stage of immunothrombosis wherein the immune system is no longer able to restrict PAMP/DAMP spreading and immunothrombosis becomes overwhelmed . As mentioned above, tissue factor-induced coagulation is important for preventing bacterial dissemination . However, excessive coagulopathy can be detrimental , and pharmacological inhibition of tissue factor or genetic reduction of tissue factor expression often rescues animals from sepsis-associated lethal coagulopathy ,,. Similarly, elimination of NETs can decrease organ damage ,, although NETs are important for preventing bacterial dissemination -. These findings support the concept that immunothrombosis can be detrimental if it becomes overwhelmed. The same is true for DAMPs. Although DAMPs have beneficial roles in immunity and tissue repair ,, excessive DAMPs can be detrimental. Serum and plasma HMGB1 levels are elevated in patients with sepsis and/or DIC , and are correlated with DIC scores. Extracellular HMGB1 stimulates tissue factor expression on monocytes, inhibits protein C activation, and promotes microvascular thrombosis development . Antibodies or antagonists capable of neutralizing HMGB1 reduce organ damage and improve survival of septic mice ,,, indicating that excessive HMGB1 circulating in the blood is detrimental. Plasma histone levels are also elevated in patients with sepsis and DIC ,. Extracellular histones trigger platelet aggregation, fibrin deposition, thrombotic occlusion of microvessels, and exhaustion of coagulation factors and platelets . Extracellular cell-free DNA (cfDNA) also acts as a DAMP . Plasma cfDNA levels are elevated in patients with severe sepsis, especially in non-survivors and have better prognostic utility than Acute Physiology and Chronic Health Evaluation (APACHE) II scores, Multiple Organ Failure Assessment (SOFA) scores, and other biomarkers . The majority of plasma cfDNA is derived from the host ,, although some originates from bacteria, fungi, and viruses. cfDNA is the major structural component of NETs, and cfDNA/NETs can promote thrombin generation, in part, through activation of coagulation factor XII ,. Depletion of cfDNA/NETs by DNase treatment impedes early immune responses , suggesting that cfDNA-mediated immunothrombosis might be important in early host defense against bacterial dissemination. In septic conditions, the procoagulant-anticoagulant balance becomes disturbed. While tissue factor- and NET-associated procoagulant activity is increased during sepsis, anticoagulant proteins, such as TM, protein C, and AT, can be severely compromised ,-. Furthermore, fibrinolysis is attenuated in septic conditions, in part through increased plasminogen activator inhibitor type-1 (PAI-1) release from endothelial cells . Thus, disturbance of the procoagulant-anticoagulant balance, with increases in procoagulant tissue factor and NETs and decreases in anticoagulants and fibrinolytic capacity, is the key feature of sepsis-associated DIC. The cornerstone for managing DIC remains the management of the underlying causes, such as sepsis, in most Western countries . Accordingly, there is no mention of DIC in the Surviving Sepsis Campaign guidelines, comprising international guidelines for management of severe sepsis and septic shock . Consequently, anticoagulant drugs might be used for the treatment of sepsis, but not for DIC itself in those countries. Activated protein C (APC) is a natural anticoagulant that can dampen thrombin generation by inactivating coagulation factors Va and VIIIa (Figure 2). APC also exerts cytoprotective effects, in part through activation of endothelial cell protease-activated receptor 1 . Drotrecogin alfa (activated), a recombinant human APC (rhAPC), used to be the only approved drug associated with significantly improved survival of patients with severe sepsis, based on a large-scale, randomized, double-blind, placebo-controlled, multicenter trial (PROWESS study) . However, the initial success was not replicated in subsequent trials of drotrecogin alfa (activated) in patients with severe sepsis and low risk of death , children with severe sepsis , and patients with septic shock , and this drug has now been withdrawn from the market . Possible reasons for this failure include the increased risk of serious bleeding in the rhAPC group and lower placebo mortality rates compared with the original PROWESS study, making it difficult to demonstrate beneficial effects of rhAPC. TM is an anticoagulant cofactor that converts thrombin into an APC generator (Figure 2). Because TM is essential for preventing intravascular coagulation  and its expression is compromised during sepsis , substitution with recombinant human soluble TM (rhsTM) is a promising treatment for patients with sepsis and DIC. Although the anticoagulant action of TM is mainly mediated by APC, rhsTM treatment may have some advantages over rhAPC. First, rhsTM may have less risk of bleeding complications than rhAPC because it is a cofactor and does not act as an anticoagulant when no thrombin exists . Second, the APC-independent actions of rhsTM might confer a benefit. These actions include sequestration of PAMPs , DAMPs ,,, and complements  through the lectin-like domain of rhsTM . In a randomized, double-blind, parallel-group trial to evaluate DIC resolution rates, rhsTM was significantly superior to heparin for DIC improvement . The 28-day mortality rates were assessed as a secondary endpoint in the study and were 28.0% for the rhsTM group and 34.6% for the heparin group (difference: −6.6%; 95% CI: −24.6 to 11.3) in patients with DIC and infection. Thus, rhsTM has been approved in Japan for treatment of DIC, although further studies are needed to confirm that rhsTM improves clinical outcomes in patients with sepsis-associated DIC. Post-marketing retrospective observational studies suggested that rhsTM therapy might be associated with better outcomes -, and an international, multicenter, randomized, double-blind, placebo-controlled, phase 3 clinical trial for rhsTM is now in progress. Severe sepsis patients with coagulopathy are scheduled to be evaluated in this trial, on the grounds that mortality rates of sepsis patients without organ dysfunction are relatively low and it is thus difficult to evaluate treatment benefits on mortality in these patients, and that patients with coagulopathy might gain greater benefits from anticoagulant therapy . AT is the most abundant anticoagulant protein circulating in the blood. AT is rapidly depleted in the early phases of sepsis through decreased synthesis, increased destruction, and enhanced clearance by thrombin-AT complex (TAT) formation ,. AT has anti-inflammatory and anticoagulant properties. Heparin enhances the anticoagulant activity of AT but may diminish anti-inflammatory effects of AT . The effects of high-dose AT treatment in patients with severe sepsis were investigated in the KyberSept trial, a large-scale, randomized, double-blind, placebo-controlled, phase 3 clinical trial . However, it showed that high-dose AT had no effect on 28-day all-cause mortality and was associated with increased risk of hemorrhage when administered with heparin. There is some evidence to suggest treatment benefits of AT in subgroups of patients not receiving concomitant heparin and complicated with DIC -. The efficacy and safety of AT need to be confirmed in further studies. Immunothrombosis plays an important role in early immune defense against invading pathogens. DIC is considered to be an advanced stage of immunothrombosis, where the immune system is no longer able to restrict PAMP/DAMP spreading and immunothrombosis becomes overwhelmed. In this stage, thrombosis is detrimental because it causes multiple organ failure. Although anticoagulant drugs, such as APC, TM, and AT, are promising options for treatment of sepsis-associated DIC, none of them have been shown to improve the outcomes of patients with sepsis. The key to success may be the selection of proper patients, proper timing, and proper dosages. This work was supported in part by a research grant from the Japan Society for the Promotion of Science (Grant-in-Aid 24390402). TI holds an endowed faculty position in thrombosis research and has received funds from Medipolis Medical Research Institute, Shin Nippon Biomedical Laboratories, Asahi Kasei Pharma, and Asahi Kasei Medical.